Dial Press Trade Paperback, 9780812984316, 896pp. James Jones (1921–1977), one of the major novelists of his generation, is known primarily as the author of fiction that probes the effects of World War II on the individual soldier. Born in Robinson, Illinois, Jones entered the U.S. Army and had the distinction of being the only individual who would become a major writer to witness the attack by the Japanese on Pearl Harbor. A member of the U.S. 27th Infantry Regiment, Jones was wounded at Guadalcanal and returned to Robinson, where he started to write about his experiences. 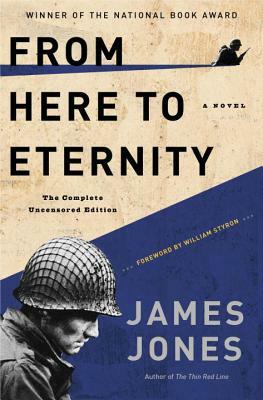 After shelving his unpublished first novel, They Shall Inherit the Laughter, Jones completed the critically acclaimed international bestseller From Here to Eternity. Jones’s other novels are Some Came Running, The Pistol, The Thin Red Line, A Touch of Danger, and Whistle. William Styron (1925–2006), a native of the Virginia Tidewater, was a graduate of Duke University and a veteran of the US Marine Corps. His books include The Confessions of Nat Turner, Sophie’s Choice, and Darkness Visible. He was awarded the Pulitzer Prize for Fiction, the William Dean Howells Medal, the American Book Award, the Witness to Justice Award from the Auschwitz Jewish Center Foundation, and the Légion d’Honneur. With his wife, the poet and activist Rose Styron, he lived for most of his adult life in Roxbury, Connecticut, and in Vineyard Haven, Massachusetts, where he is buried.